MC4 connector interface generally depends on its application, but also to meet the requirements of electrical and mechanical properties. BMA connectors are commonly used in blind-plug connections for low-power microwave systems with 18GHz frequencies. The BNC connector adopts bayonet connection, the frequency is usually less than the 4GHz radio frequency connection has the very good application, generally in the network system, the instrumentation and the computer interconnection domain we can see it silhouette. The interface of TNC is similar to that of BNC. It can also be used in 11GHz and has excellent performance under vibration condition. SMA screw connectors are widely used in aviation, microwave communication, digital communication and other military and civil fields. Its impedance is 50 Ω, and the frequency used in flexible cable is less than 12.4GHz. If semi-rigid cable is added, its frequency will reach 2635GHz / 75Ω, which is a good extension in digital communication. SMB specification is lower than SMA, can insert self-locking structure, fast connection is simple, mainly in the use of digital communications, is the replacement of the L9 product. Similar to the SMB, the SMC is critical for military and high vibration environments in that the spikes ensure greater mechanical performance and a wider frequency range. People who understand the relevant market should know, MC4 connector in today’s various areas of the application of what is the case. The wide range of MC4 connectors can be found, especially with the development of new technology and new technology, there are more and more products using MC4 connectors in the market. The source of the market and consumer trust in MC4 connectors is inextricably linked to the actual value of the MC4 connector itself, as can be seen from the fact that MC4 connectors are present in all aspects of their actual use. The MC4 connector is simple to use and easy to operate as a whole. 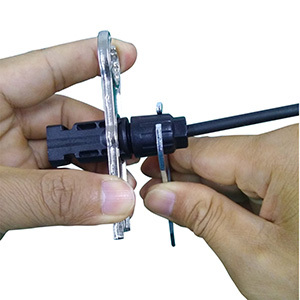 And whether the connector itself fails or the equipment fails, it can be dismantled and assembled in a very specific way, and it is also very convenient to replace new parts. This effect has made a great contribution to the improvement of the customer operation experience. From an enterprise perspective, the use of MC4 connectors also makes the assembly of their own products greatly simplified. Not only that, but also for this reason, in the transformation of mass production, MC4 connectors are also playing an important role. Category I: traditional solar junction boxes. Advantages: clamp type connection, quick operation and convenient maintenance. Disadvantages: due to the existence of electrical terminals, junction box volume is larger, heat dissipation is poor. The cable holes in the shell cause the product to be watertight. Wire contact connection, the conductive area is small, the connection is not reliable enough. 1. Adopting the metal terminal with good heat dissipation to replace the electrical terminal, and soldering to increase the contact area. 2. To increase the reliability of the connection, a “double-safety” fixed connection with the screw is adopted. 3. Adding heatsink to improve the performance of heat dissipation. 4. The high density PCB welding method is adopted to reduce the contact resistance. The emergence of connectors for many industries is of great significance, especially for some industries or products, after the application of connectors will also bring them to a new path of development. However, the development of domestic connector industry is not smooth sailing, but also encountered a lot of problems. The formal development of domestic connector industry is from the 1950s or so, or in the period before the reform and opening up. Because of a variety of reasons, the connector industry is relatively slow to develop, such a situation until more than 30 years later began to gradually change. In that era, the application of color TV has also become a major dumping target of connectors, and connector enterprises produced products are also relatively low-end. In the 1990s, a number of potential enterprises appeared in the domestic connector industry, and began to learn various advanced technologies and management methods from abroad, and introduced high-tech equipment. Began a formal update to the connector industry. Since then, the domestic connector market has made a qualitative leap in terms of quantity, variety and quality. Products such as MC4 connectors and photovoltaic connectors are also on the market.